With the first of two new buildings already near completion, DePaul Cristo Rey leaders are thrilled to announce the school’s first capital campaign has surpassed its fundraising goal. The Building. Futures. Together. For a Greater Cincinnati Campaign has raised $20.8 million in less than two years; that is $645,000 above the campaign’s goal. The campaign has been led by Cincinnati business and community leaders Cynthia and Manuel Chavez and Vicky and Rick Reynolds. 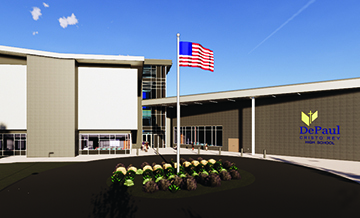 a new student center/gymnasium/cafeteria will be finished in the summer of 2019.
construction will then begin on a three-story academic building expected to be open in the summer of 2020.
when the entire project is complete, all campus buildings will be connected with a reconfigured campus entrance, new parking, and the space and resources to support the academic and social needs of students. This is a rendering of the new front entrance. exterior improvements to the existing buildings. The campaign has now moved into a second phase to raise an additional $4 million for DePaul Cristo Rey’s innovative Graduate Success Program which provides financial and human resources to ensure college completion for all DPCR alumni. You can make a gift here to the Securing Our Graduates' Success Campaign.